RoundRail Steel Fence Brackets for Continuous Fencing. Steel Fencing That is Easy to Install, Permanent and Maintenance Free. RoundRail costs less than other pipe-rail fencing. Our brackets work with any 2 3/8" O.D. pipe - including drill stem. The posts can be driven or set in concrete. The fence follows the grade of the land. Permanent steel fencing that is maintenance free with one person installation. The lowest priced steel fencing available anywhere. Continuous steel fencing is strong, permanent and maintenance free. Sometimes known as pipe-rail, continuous steel fencing will never rot or decay like wood fencing will. 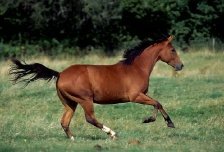 Horses have a tendency to crib on wood rails leading to their continual replacement. With steel rails this is never an issue. Wood posts rot over time and need to be continually replaced. Steel fence posts never rot and will never need to be replaced. Unfortunately continuous steel fencing has always been expensive. Until now. With RoundRail fence brackets you can build a continuous steel fence that will suit both your needs and your budget. The fence can be designed with as few, or as many, rails as desired. With the RoundRail fence bracket post spacing is variable depending on your situation. The posts can be placed closer together for animal containment or farther apart for boundary or perimeter fencing. The distance between posts does not need to be exact which makes installing the posts faster and easier. There is no need to have the posts exactly eight feet on center as with some other continuous steel fencing. The posts can be driven by hand or with a powered post pounder. The posts can also be set in concrete. Posts and rails can be light or heavy duty depending on the situation and the budget. The posts and rails are available from any local fence store or home center. Posts and rails come in a galvanized silver color or different colors like black, green or brown. RoundRail fence brackets can be painted or powder coated locally to match the posts and rails. RoundRail continuous steel fence brackets make for the lowest priced, and most easily installed, pipe-rail fencing available anywhere. For farm, ranch or home. 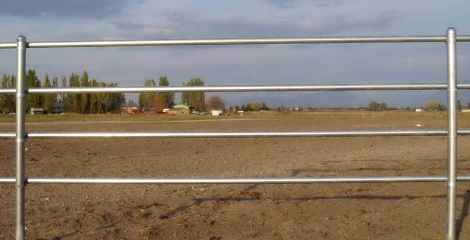 See how easy it is to install a continuous steel fence with RoundRail fence brackets.